August 29, 2016 – In this episode, our time machine sets sail in the aftermath of World War Two, on a mission to feed the hungry that endures to this day, through Heifer International — those folks who help you give the gift of livestock. It’s a storybook for kids called The Seagoing Cowboy, and it tells the story of the ships that once carried weapons and soldiers, turning to humanitarian cargo: Livestock, farmers, teachers and others, who answered the call to rebuild the devastation. Our guest is author Peggy Reiff Miller, the granddaughter of one such cowboy, 7,000 men from the ages of 16 to 72 who pitched in under the auspices of the United Nations Relief and Rehabilitation Administration. 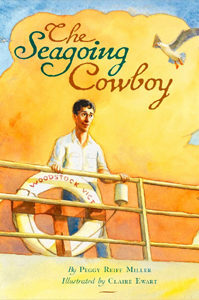 The Seagoing Cowboy is illustrated by Claire Ewart, and available exclusively through Brethren Press. You can join the effort to carry on the cowboy’s work, at Heifer International by visiting Heifer.org, and learn more about this story, at SeagoingCowboys.com.